Try out Balloon Pop to see how high your skills at ordering numbers can take you! As the owner of your own store, it is important to take the very best care of your customers. As they select their purchases it is your challenge to give each of your customers the correct change to keep them happy. The more customers you can serve in the time provided, the higher your score in the game of Cash Out! It's your turn to pretend you work at a convenience store where customers depend on your math skills to return to them the correct change from their purchases. In the game Making Change, see how many customers you can help from your post behind the cash register! 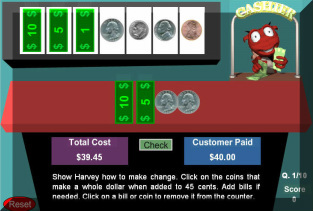 FunBrain.com offers a great way for you to test your change making skills with the game Change Maker! How good are you at your money management skills? See how quickly you can make change using the fewest amount of coins and bills possible! Take the challenge with the game Making Change! Welcome to the Math Nook! Practice rounding numbers to the nearest tens place with the interactive card matching game of Match Around! Practice rounding to the nearest 100 as you navigate your very own speed boat around obstacles. Gain points and work your way through the levels as you collect flags and bonus points on your water adventure in Mathboat Rounding.